When a couple is planning to share their lives together, having wedding bands that match is a wonderful way to symbolize that commitment. 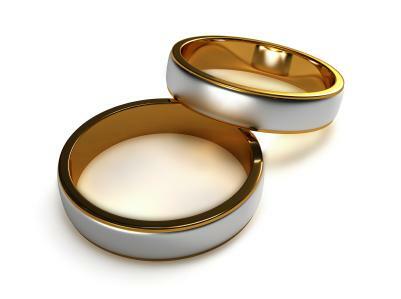 There are many options to consider when it comes to wedding bands, so choose something that you both will enjoy wearing and that holds a special sentiment for each of you. Matching rings don't necessarily mean that the rings need be precise replicas of each other. They can also match because they are complementary or have drawn inspiration from a common source. When buying matching bands, there are many considerations to take into account. Think about your budget, any concerns with wearing the ring to work as well as preferences to metal and specific designs. Once you have an idea of what type of ring want, the choices are endless. Engraving: Engraving the inside of the ring with the couple's initials and wedding date or a special message or sentiment. Matching stones: Using stones in both rings that match one another is another option to consider. Besides diamonds, there are other stones that can be placed into a wedding ring. Couples may wish to use their birthstones or a stone that is special to them both. Symbol or pattern: Incorporating a special design into each ring such as a symbol or a unique pattern. This can easily be done if you are having rings custom made. Since most couples go with routine bands, which are usually either yellow or white gold with not much decoration on them, you can really get noticed by choosing a unique style that sets you apart from all others. Jewelry Vortex has matching textured bands in a variety of styles, including braids, checked patterns and waves. They are available in both yellow and white gold. GoldenMine has a set of 14K white gold designer textured bands that have a rope texture along the top and bottom of each band. Although they may not be right for every couple, there styles of diamond wedding bands appropriate for either gender available. World Jewels has a wide variety of his and her diamond bands. The rings can be done in 14K gold, 18K gold or platinum. 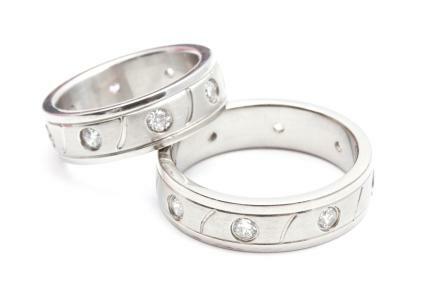 This set features four diamonds set on a diagonal in the center of the bands. 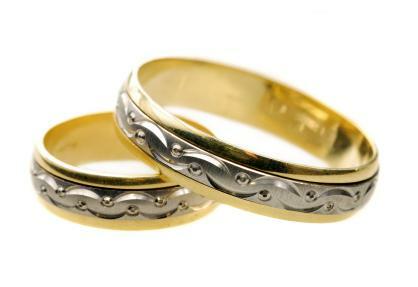 Appealing Wedding Bands has Matte Finish His And Hers 14K Gold Diamond Wedding Rings. These comfort fit rings feature a small diamond in the center of each matte band. These bands differ from their textured counterparts because instead of being molded into a specific shape, the bands are smooth with the pattern in the metal itself. Often, patterned bands contain a mixture of two metals to create a stark color contrast. Titanium Jewelry features Timoku rings that are a mixture of black and grey titanium, which creates a swirl effect on the finished product. It is meant to resemble the rings on a tree. Claddagh wedding rings feature two hands clasping the outside of a heart. The heart wears a crown to symbolize loyalty and friendship. The heart itself, of course, symbolizes love. These rings, which are of Celtic origin, are certainly unique and perfect if you or your spouse has roots in the Celtic heritage. If wearing a Claddagh as a wedding band, be sure to wear it with the crown nearest the knuckle. The Viridian Gold Jewelry Store in both men's and women's versions. You can also get textured Claddagh bands, which feature the Celtic knot. Glencara features a wide assortment of rings for both men and women. Browse through the large selection to find the style that works best for you. Green Lake Jewelry: Browse designs, share your ideas or sketches, and work with a designer at Green Lake Jewelry to come up with a set of matching rings. Rings are handmade and available in many different metals, finishes, and design styles. Sorella Jewelry has the option of modifying one of their existing pieces for a personalized look, or creating an entirely custom design for your bands. Sun Jewelry offers a wide selection of custom ring styles, many of which are simple but beautiful designs suitable for men's and women's bands. 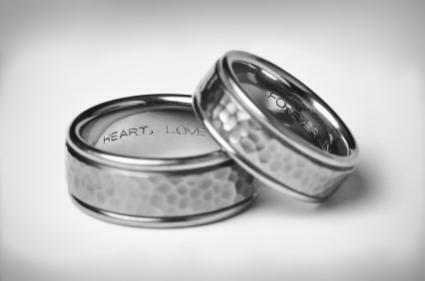 Buying matching wedding bands will be one of the first major purchases a soon-to-be married couple will make. While it won't be the last, it will certainly be one of the most significant and should provide an everlasting symbol of love and commitment.